Malco Hand Seamers, with forged steel jaws, are the premier choice for bending, folding, flattening and straightening sheet metal edges or safely gripping and moving sheet metal around the job site. These seamers are available in 3 inch (76.2 mm) and 6 inch (152.4 mm) jaw widths as well as an offset 3 inch (76.2 mm) size for overhead work. The drop-forged, high-impact jaws feature depth markings graduated in 1/4 inch (6.4 mm) increments and are complimented by a powerful compound leverage design. Easily bend flanges or completely flatten seams from 1/4 to 1-1/4 inch (6.4-31.8 mm) deep in 24 gauge (0.71 mm) galvanized or (0.61 mm) mild steel. 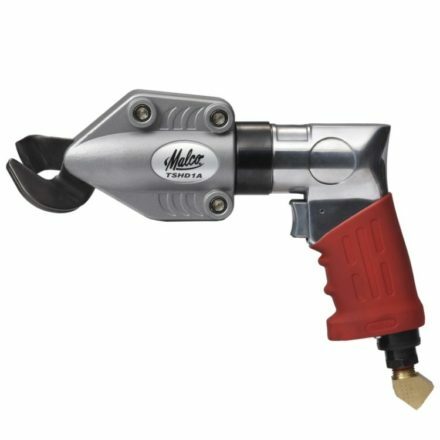 Malco’s Hand Seamers, with forged steel jaws, also feature ergonomic RedLine Handle technology. An Engineered handle opening compliments the natural power stroke of any user’s hand and maximizes the powerful 7:1 mechanical advantage of compound-leverage head to handle linkage. Comfortable handle grip contours, a non-slip grip insert, spring handle actuation and a thumb-operated handle latch ensure a natural fit and feel for comfortable one hand operation anywhere on the job. Bend, fold, flatten, straighten sheet metal on the job. Depth markings graduated in 1/4 inch (6.4 mm) increments to a full 1-1/4 inch (31.8 mm) jaw depth. 24 gauge (0.71 mm) capacity in galvanized steel. Used this in conjunction with some larger metal hemmer/benders when I did a standing seam metal roof over our side porch. Works very well for short hems or custom bends. Works great for what it is made for and I was glad I had it for this job. Very comfortable to hold and well built, I'm satisfied with my purchase and i will recommend this hand seamer to every professional, it's worth the money. It works as it should,the grips are comfortable. I like the 1/4" graduation marks, thank you very much.